(1jun06) This issue will discuss "headroom". The 15jun issue will rerun the rowboat setup essay. 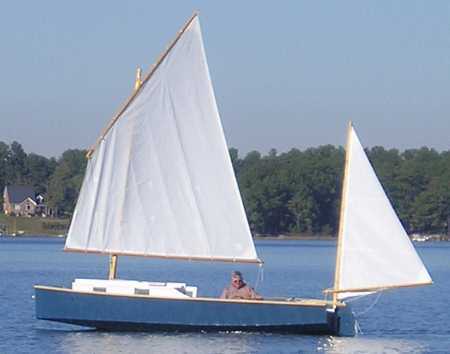 THE 17TH MIDWEST HOMEBUILT BOAT MESSABOUT will take place at Rend Lake in Southern Illinois on the weekend of June 10 and 11. Remember that lots of folks come on Friday and leave early Sunday. Take I-57 to exit 77W and then follow the signs to the Gun Creek Recreation Area. There is no schedule of events except a pot luck dinner in the campground on Saturday evening - we wing it. Some of us have reserved the campsites on the water of the two middle camping loops so look for us there if we aren't at the boat ramp. Pete Simmons sails his new Skat up in Minneapolis. 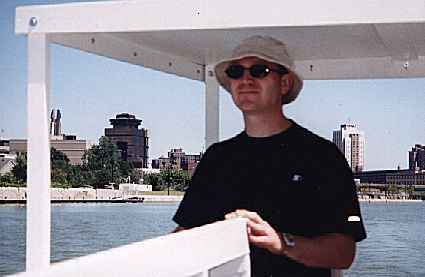 I have been doing this boat thing for over 15 years now. I know that everyone wants a low sleek boat. The lower and sleeker they look the better they sell. At the same time everyone "wants" lots of headroom inside a boat's cabin and they ask about that all the time. But when it comes time to buy a set of plans sleekness wins over headroom by maybe 100 to 1, so overwhelming a ratio that there is no point in designing a boat with lots of headroom. 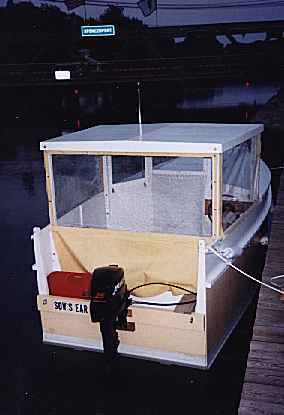 I gotta tell you I designed the boat featured below, Sowsear, with high sides for a fellow who wanted to be able to change his pants in some privacy. His first comment was that he wanted to cut the sides down! I recall one of the Herreshoffs once asked something like, "Why a cabin with standing headroom? Do you sleep standing up?" Standing headroom is hard to come by in a small boat. I need six feet of it and consider that a fair standard. 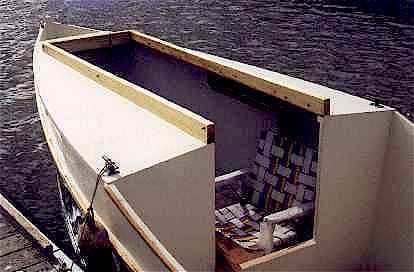 Some designs get it by having you step down inside a deep V bottom or a keel box. I've never heard of such a design performing well but I don't see why it can't be made to work. Draft will be deep, of course. Trailering and launching an order of magnitude more difficult than with a shallow boat. Thus I have never drawn one this way and don't intend to start. 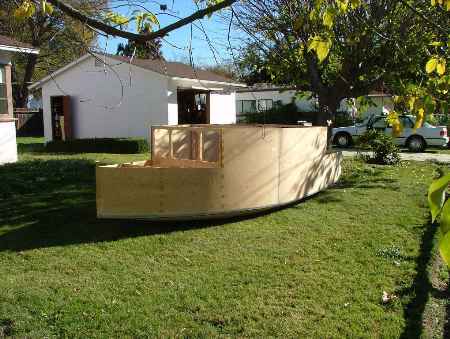 You can have shallow draft and standing headroom by building up the topsides and get a "freeboard special". These boats are made fun of all the time - until you step inside of one and experience the comfort. The skipper must sit really high to see over the cabin and that doesn't make for the feel of spirited boating. Often this sort of boat needs a lot of ballast to counteract the elevated mass of the deck and rig and that of the crew and passengers strolling the high deck. But a raised deck freeboard special also can have a lot of buoyancy up high to enable it to recover from a knockdown. A compromise is sometimes a standing headroom aisle down the centerline in the form of a raised trunk cabin. Thus you have a place to stand and stretch or change clothes and yet the main walking decks can be couple of feet closer to the waterline. The areas under the walking decks need only have sitting headroom. Most folks need three feet of sitting headroom. Three and half feet is better yet to allow a cushion or low chair. Some of my cuddy designs like AF4 have it, but usually only near the main bulkhead. Up forward where the bottow usually sweeps up, there is less headroom. So when you decide on an interior, make sure your head will be where the headroom is maximum. Don't put a cabinet there and stow your gear there. That will push you forward into the smaller part of the cabin. On really small beach cruisers, the kind that will tow behind a midget car, I've gotten by with two and a half feet of headroom but need to lean back or forward a bit to fit myself under the roof. 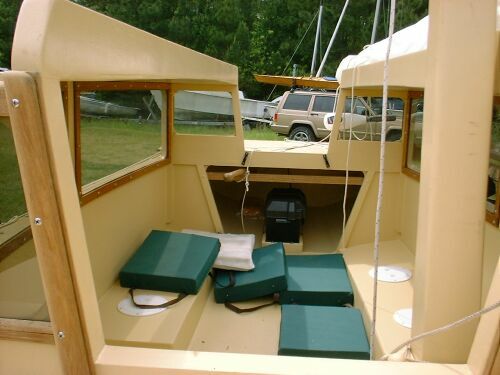 This set up will work as a minimum cuddy cabin cruiser because the skipper can see over the top of the cuddy if it is less than three feet high. More than that and he must sit on an elevated platform of some sort. 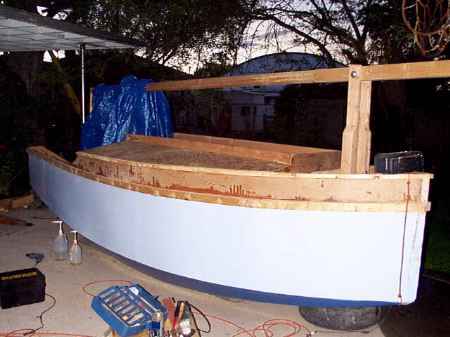 Make him sit high enough and your minimum cruiser will need ballast to counteract his weight, etc., etc., and it won't be a minimum cruiser anymore. A boat like this should never have any built in furniture - you need to think in terms of backpack gear and not too much of it. 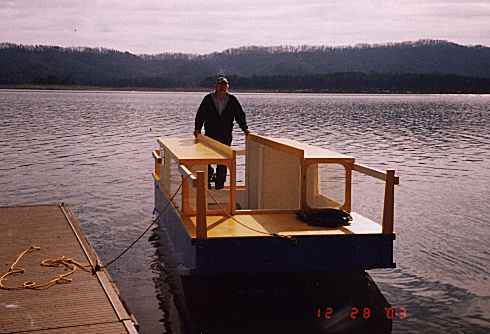 I am reminded of my old late friend Jim Huxford who had a Bolger Otter back when we were just getting started with homebuilt boats. The Otter was very low and sleek indeed, about 20' long with a cuddy about 2' deep! You could crawl inside of it and sleep and that was the idea. Jim had never seen such a thing and asked, "You mean you are supposed to sleep in there?!" When I looked beyond the little cabin door I saw he had it full of sails, ropes, etc.. No room for a sleeper at all. I suppose a person can actually sleep under a deck with two feet of space to allow him to roll over and night. He can't sit up. I've seen bunks like that under cockpits of some big cruisers. It reminded me of a slave ship or a slot in the morgue. In a small boat I'd be much happier with an open top and a tent cover. Phil Bolger also dreamed up his Birdwatcher to solve that problem. 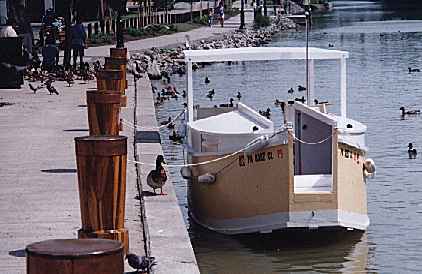 The Birdwatcher is basically a large simple skiff with stem to stern seating under a plexiglass roof with three and a half feet of "headroom". The skipper sits under there too. A two foot wide slot extends down the centerline the whole way to allow stand up walking. 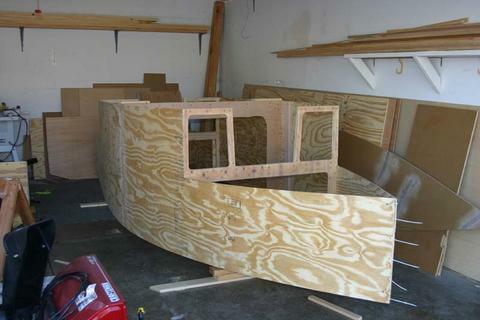 And yet the decks on the sides are wide enough to support the boat in a knockdown and keep her from flooding. Birdwatcher has no ballast besides her 1" thick bottom but with her crew sitting low on the floor she needs none. The scheme works Even sailing her light I don't see how Birdwatcher could be capsized by wind alone. Mine would lay over about 50 degrees and heel no more. For a trailer cruiser this is all very good because she is very light for her size and for sailing with small children she is about unbeatable. The kids are always safely corralled. I've copied this idea over and over. Maybe I've designed more Birdwatcher cabin boats than Phil has. I have always found them roomy and comfortable but some folks just gotta sail outside. 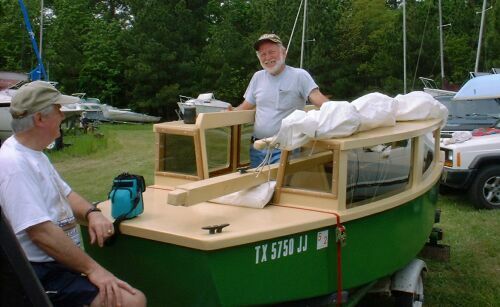 Here is Jerry Scott with his IMB, my smallest Birdwatcher type design at just 13'. 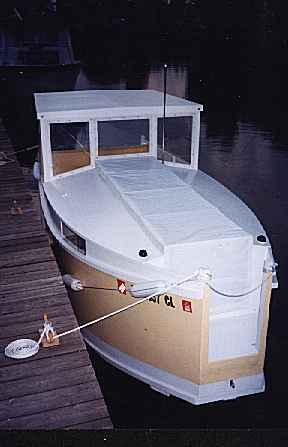 The open slot allows one to walk, with feet secure on the floor and standing up, straight to the bow transom. On boats like Sowsear I made it so you can walk right out the bow! So I think the benefits of a Birdwatcher layout can go way beyond a glass topped sailboat. 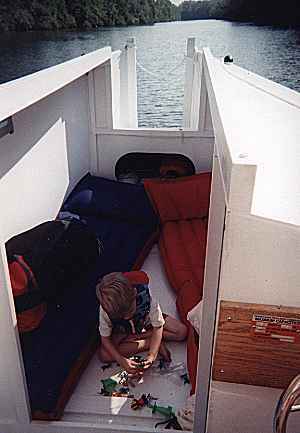 Almost any smaller cabin boat, sail and power, could use the slotted roof to provide standing room and walking access in good weather. NEXT TIME: We will rerun the important essay on setting up a rowing boat. 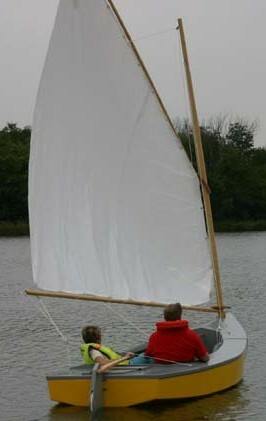 Sowsear was my seventh boat so it went together pretty quickly. It took me about two weeks of evenings to get it to the stage in the photo where the hull is overturned and the bottom is glassed and painted. After that I had less time available and it took another two months to complete. Only two glitches occurred during the assembly. On sheet 2 of the blueprints the bow transom reads 9" and it is really 12". I should have used my scale instead of using what is written. The other thing was that I built the stern transom to short shaft dimensions and later found a good deal on a long shaft motor. Both problems were easily remedied. 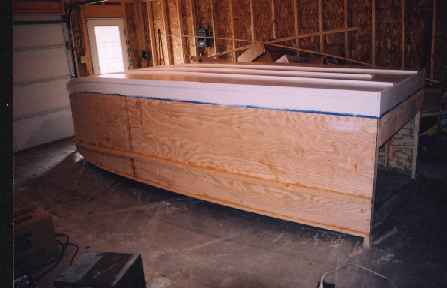 The boat was built using AC exterior Douglas Fir from Home Depot, epoxy for all joints, and was painted with latex paint. It has held up well with just a tarp over it. The PA Fish and Boat Commission rated it at 65 HP and five person capacity. I put a 25 hp on it with remote controls and that is plenty. The boat planes at about 2/3 throttle as I recall is traveling in the upper teens for mph on the gps. I have run it at full throttle a few times but don't know top speed. I am not comfortable at all running the boat up on plane. I used a lot of epoxy and screws in assembly so I know it will hold up, but the drumming noise on the big flat bottom makes me anxious and that's not why I'm in a boat so I usually run at far lesser speeds. Seven to ten mph seems good to me. 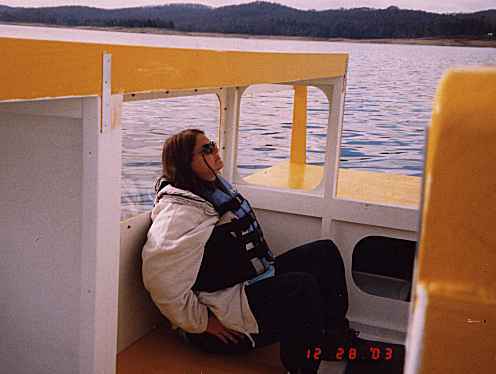 At that speed with two adults on board the boat trims better if one person heads up front. When encountering another boat's wake it is best to throttle way down and turn the side toward the wake and endure the rocking. Otherwise you'll get a nice big splash of water over the bow. This boat requires a lot of attention to the helm when the wind picks up, it gets blown all over which can make it tricky maneuvering into a canal lock. 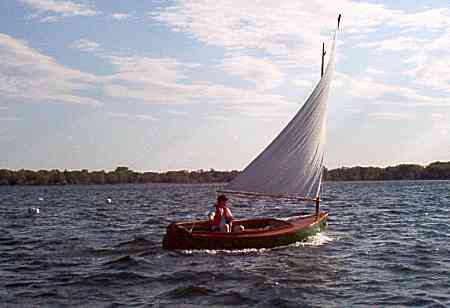 I once had it out in a dammed portion of the Susquehanna River here in Pennsylvania when the wind really picked up. Whitecaps formed and I had to quarter to the waves, which I would estimate at one foot, all the way back to the boat ramp. It was not a situation I want to be in again. The local Fish and Boat Commission patrol boat passed me on the way and they didn't seem too concerned so I guess I looked safe enough, but it certainly wasn't fun. Sowsear is, of course, at its best when used for camping. It makes a good camper on the trailer at a campsite, although climbing in and out is tricky. I've had it on four trims of three or four days on the Erie Canal in New York. The photos show three different summers. The first summer I went by myself and just threw a tarp overthe top to camp. You can see it is very bare bones in the first photos. The next year I put running lights on, and made a cockpit softtop out of polytarp and poles. This didn't work so well so in the third year I made a hardtop with which I am very satisfied. It also fits nicely lowered down over that big cockpit and keeps the rain out when trailering and storing. On the last trip I added the side curtains and windows so it can be run in the rain. 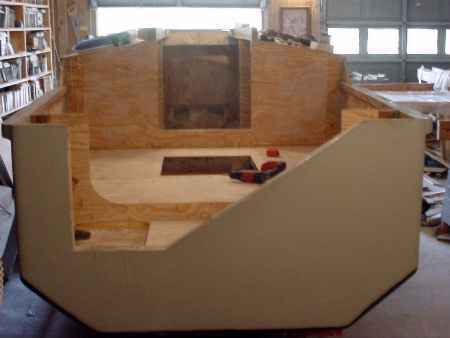 Although I have been using a polytarp cover for the walkway hatch I intend to make some sort of segmented hardtop for the walkway and doors for the bow and cockpit access. 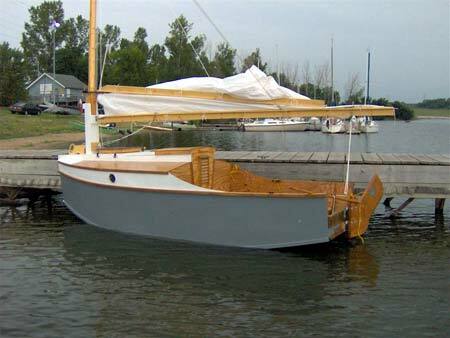 Although the bow of Sowsear is good for a beach landing, the boat is tricky to et in and out of when tied to a dock, which is basically all you do on the canal. My son Noah, ages 5 and 6 in the photos, loves the boat. Plenty of room for lounging at his age. My nephew Kevin, also pictured at age 16, has been coming along. They slept in the cabin on air mattresses: I slept in the cockpit on a beach chair laid flat which fits from corner to corner. On my last trip my wife, son and 3 year old daughter came and we all comfortably coexisted although we heard lots of comments like "They've got two little kids in that boat, can you believe it?" We didn't get a single photo on that last trip, although enjoyable, much of it was gloomy weather and we were occupied with the kids. Sowsear elicits either delight or derision from people who see it. Teenagers tend to point and laugh, I once got a lot of hoots and stares when I drove it down to a launch area with a lot of sparkly bass boats heading out for a tournament, and my father-in-law thinks it is the ugliest boat he has ever seen. But the vast majority of people love this boat. It is almost impossible to get in or out of a parking lot without someone asking about it. I once stopped at a scenic waterfall along the Finger Lakes and a guy who where there to renew his wedding vows came running over in his tuxedo to see it. One guy saw me from a bridge over a river and drove down to the launch area to wait for me to come in. You'll have company for hours if you decide to park it in a campsite somewhere. All along the Erie Canal people wave and smile. Docked at a canal port lots of folks will stop to ask questions. One canal worker told me people all along the canal were talking about my boat. I've always told people that you are the designer, although I am embarrased to say I just discovered I have been mispronouncing your name. Thanks much to Erwin for his great letter and photos! Sowsear plans. now updated per the above letter, are $35.